I have to say, the Penclic has the most fabulous and elaborate packaging I’ve ever seen on a gadget. It’s less a box and more a trophy cabinet and really quite pretty, I just hope it’s all recyclable. When you’ve finally figured out how to break into the box, it contains the Penclic mouse, a small USB radio receiver/dongle, instructions, technical specs document, storage bag, battery and charging cable. The battery is a generic AAA NiMH rechargeable battery and it’s completely replaceable. You can also use a standard alkaline battery in the Penclic, just don’t recharge it. The included charging cable is also generic, microUSB at one end, standard USB on the other. If you lose it, you’re bound to have another one somewhere and the included one winds up so it’s easier to store. Also very thoughtful. On the bottom of the “foot” of the Penclic is a physical On/Off switch, which you can use to turn it definitively “off”. If you forget it will turn itself off after 10 minutes of no use. The manual says the Penclic should run for 3 months on a charge. The Penclic has a user-selectable range of resolutions from 800 – 2400 dpi using buttons on the mouse. Because the Penclic uses the standard HID-compliant mouse drivers there’s no software to install and it just works with Windows, OSX and Linux. The Penclic has five buttons with a scroll wheel. The left, right and middle buttons are lined up along the top of the “pen”. Under the thumb there are two Back and Forward browser buttons. The buttons are the right mix of easy to click but not so easy that you misclick when you shift your grip on the pen. The scroll wheel is on the “foot” of the mouse which you can scroll using either your middle or index finger. The foot of the Penclic is hard, shiny plastic as is the end of the pen part. The gripping surface of the pen is a matte plastic, rubber-like plastic which is very easy to grip. The scroll wheel is a shiny silver plastic with a rubber “tyre” which makes the wheel easy to turn without having to press it. The scroll wheel is a click-type wheel instead of a free-scrolling wheel. The pen part is flexible where it meets the foot and can also be rotated so you can find the optimal angle of use depending on how far out you hold your mousing arm. All very ergonomic and comfortable. I suppose you could use it left handed but you’ll lose the Forward/Back browser buttons. The first thing I noticed with the Penclic was how effortless it feels when you start mousing with it. Even though it has a large foot hanging off the end of the pen, the whole thing feels weightless. The only weight you’re supporting is the small pen attachment and you can’t feel that at all, the whole thing slides effortlessly across the desk. The pen height angle is adjustable, but the also the angle of the pen to the foot, so you can have the Penclic in close to your body or mouse out wide and the foot angle can be adjusted. This is a great idea as it means you can slide up the desk and the mouse cursor moves vertically instead of at an angle. I found the mouse way too sensitive on any setting over 800dpi and even then I had to slide the mouse driver sensitivity down further. I’ve been using the Penclic for over a week now, doing all the normal things I do; surfing, writing and editing, drawing and touching-up in Illustrator and Photoshop. My normal mouse is a 3M ergo mouse for normal mouse-things, and a previous-generation Wacom tablet for fine-detailed work. 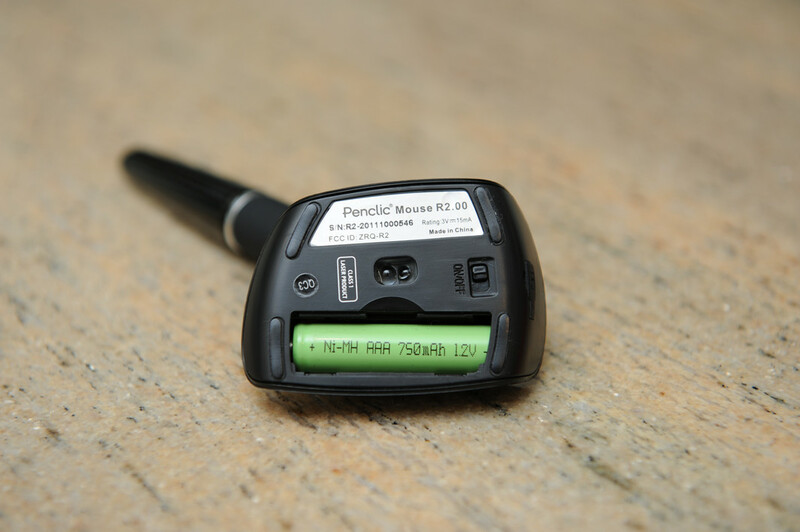 For my particular situation the Penclic is ideal as I have the mouse and scroller for documents and if I need to jump in and do a bit of photo retouching or drawing the Penclic is very easy to use for that as well. My main gripe with the Penclic is the location of the scroll wheel. I found it was just too far away from the pen to be comfortable. I have large-ish hands but even for me it was a stretch to reach the scroll wheel comfortably and reliably. My index finger couldn’t reach the wheel so I had to use my middle finger which was a little uncomfortable, not the end of the world though. The other gripes I have, and they’re more of an inconvenience, is that there is nowhere to store the USB dongle when the Penclic isn’t being used. Penclic do however provide a storage bag for the mouse, cable and dongle. The other small issue I noticed is that the optical sensor is infrared so when you pick up the Penclic to pack up you don’t see the blinking red LED to remind you to turn it off. The Penclic will switch itself off after 10 minutes of non-use. After 10 days with the Penclic, I love it and it’s now my everyday mouse, hands-down. The pen-like angle has made my grumpy elbow much happier and there’s no need to grip it with any muscles, it sits comfortably in a relaxed hand allowing you to switch from ordinary computer mousing, to detailed work and even read through documents and surf. I can just get on with my work and not have to keep swapping to a different mouse to improve my work or relieve my aches. People without ergonomic concerns will also find the Penclic useful, especially if you do any sort of detailed mouse work, drawing or sketching. 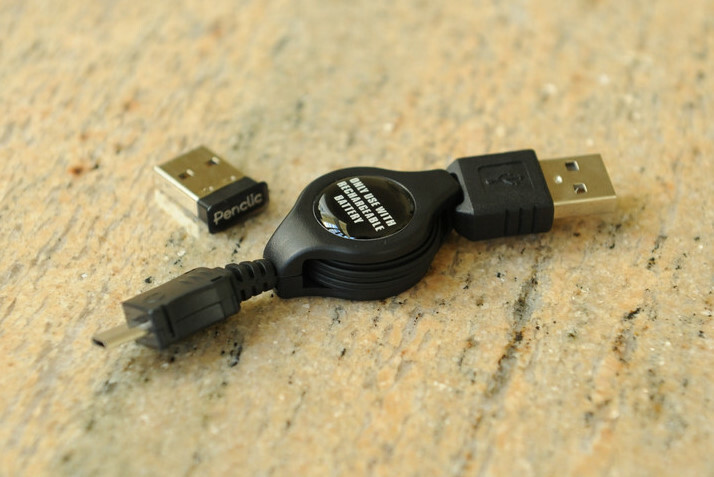 The Penclic comes in wired and wireless versions and you can pick them up from Amazon. Highly recommended. I guess this is a no for lefties??? Not entirely Rick, you could use it left handed, but you'll cover up the Forward/Backward buttons on the side of the pen. It's probably the most left-handed friendly ergo mouse I've used but that's not saying much. @Rick, looks like it. I like the concept a lot, but for me one of the most important parts of my mousing life is the scroll wheel, and in that universe the Logitech free-wheel technology just dominates. I don't think I could return to manually having to scroll a wheel to navigate a page, now all I do is a flick and whoosh….! As a fairly new web design/SEO/marketer I was growing increasingly concerned with what felt like the beginning of Carpal Tunnel syndrome; a little research familiarized me with the term RSI. This sounds great I can't wait to try it, thanks for the review. I appreciate the level of detail in your review. I think I'll check out the mouse.